2 1. can not have pp. ～했을 리 없다 She can not have been a biologist. He can not have said the fact. 2. may have pp. ～했을지도 모른다 He may have gone to the party last night. Something may have been wrong. 3 3. must have pp. ～했음에 틀림없다 He must have left his umbrella on the bus. The ship must have arrived there yesterday. 4 ◎ must have pp. 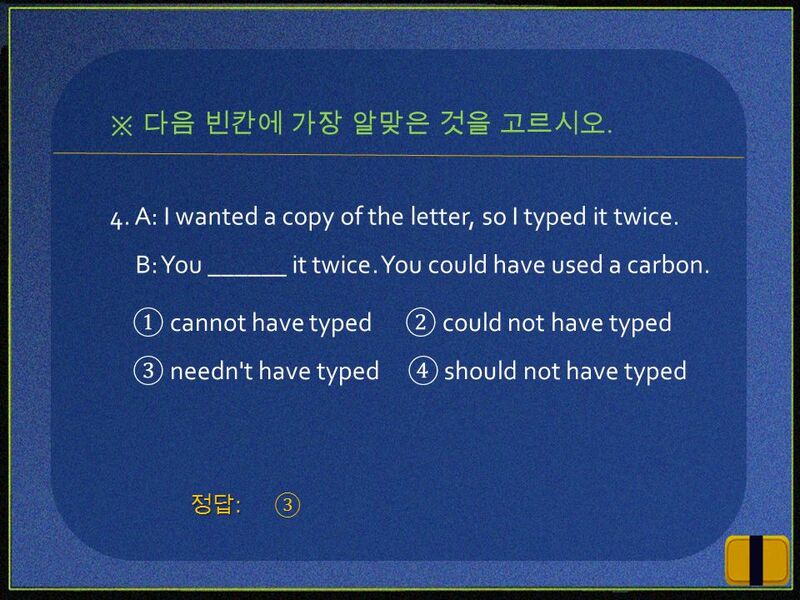 의 반대개념은 can not have pp. The old man must have been a professor in the past. 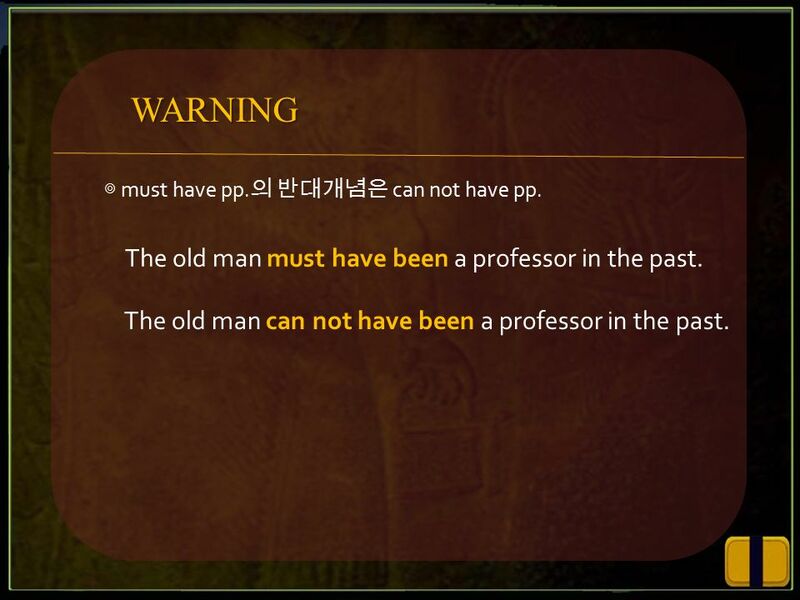 WARNING The old man can not have been a professor in the past. 5 1. 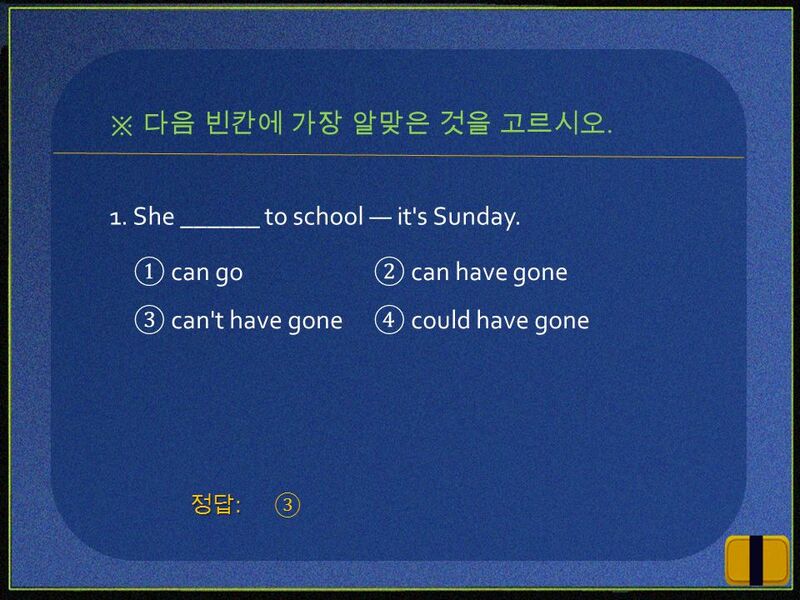 She ______ to school ― it's Sunday. 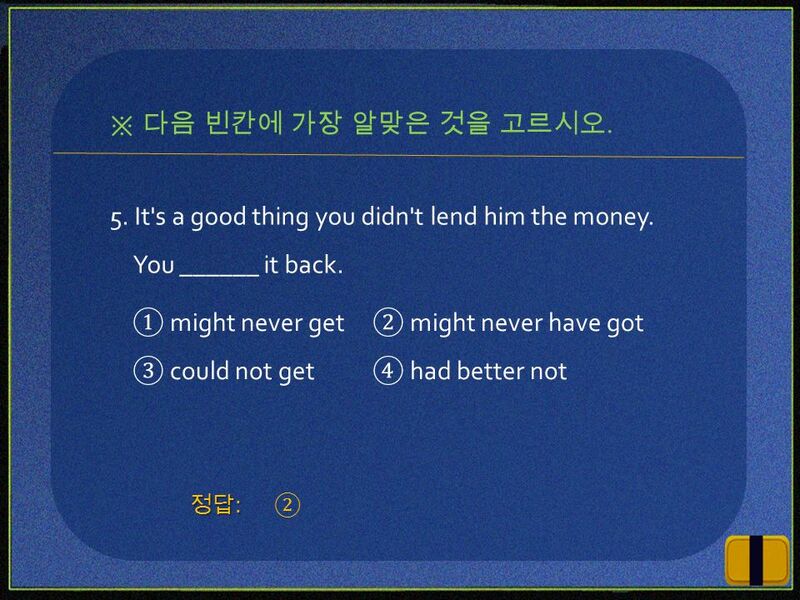 ① can go② can have gone ③ can't have gone④ could have gone 정답: ③ ※ 다음 빈칸에 가장 알맞은 것을 고르시오. Download ppt "KEY POINT ∥ can not/may/must + have pp. → 과거 사실에 대한 추측 조동사 have pp. 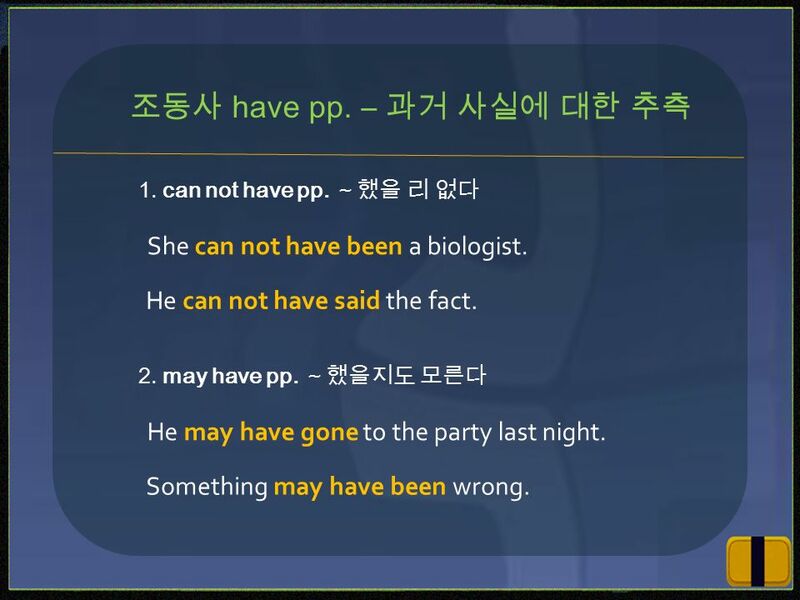 ― 과거 사실에 대한 추측 can not have pp. 과거 사실의 부정적 추측～했을 리 없다 may have pp. 과거사실의 추측～했을지도 모." 동사의 과거형 - 불규칙동사 2 drive → droveride → rode rise → rosewrite → wrote cost → costcut → cut hit → hithurt → hurt let → letput → put shut → shutspread → spread. KEY POINT 1 ∥지각동사는 감각의 활동을 나타내는 동사 를 뜻한다. 이러한 동사들은 목적보어로서 원형부정사를 쓴다. 다음과 같은 동사들이 이에 속한다. 지각동사 feel 느 끼다 hear 듣다 listen to 듣다 look at 보 다 see 보다 watch 보. 1 Ch 10. 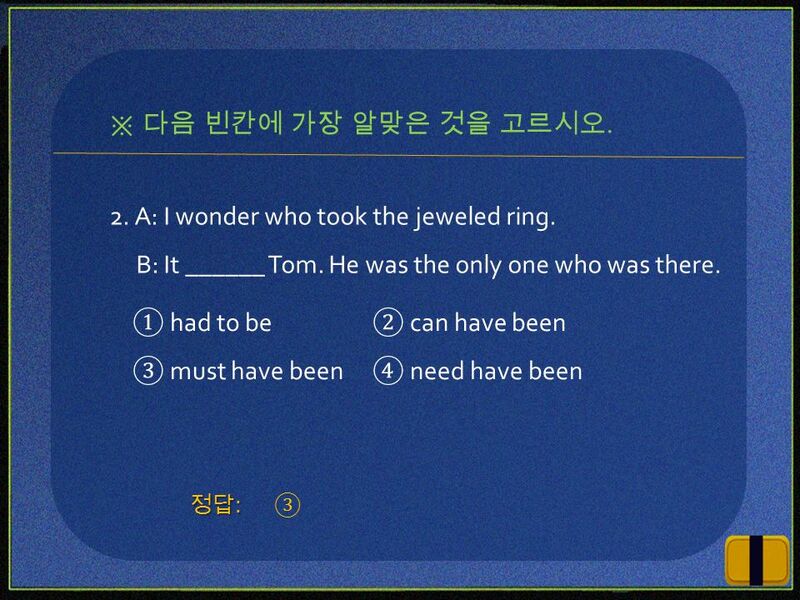 Modals 2 정샘 영어 Academy Understanding and Using English Grammar. must 는 남성적이다 수동태로 영작 하기 You must obey your parents. 「부모님 말씀을 따라야 한 다. 」 You had to obey your parents. 「부모님 말씀을 따랐어야 지. 」 1-1. 의무의 must I ’ ve got to go. 제 15 장 동사의 시제 1. 동사의 과거형 2. 현재시제 3. 과거시제 4. 미래시제 5. 동사의 완료시제 7. 시제의 일치 6. 진행형의 여러 가지 형성 평가. … 할 수 있다. = be able to I can run to my house You can run to your house He can run to his house She is able to run to her house We are able to run to our. REVIEW ∥ too 는 [ 너무, 지나친 ] 의 부정적 뜻을 가지며, [too + 형용사 / 부사 + to- 부정사 ] 구문으로 [ 너무 ~ 해서 ~ 할 수 없다 ] 의 뜻을 갖는다. 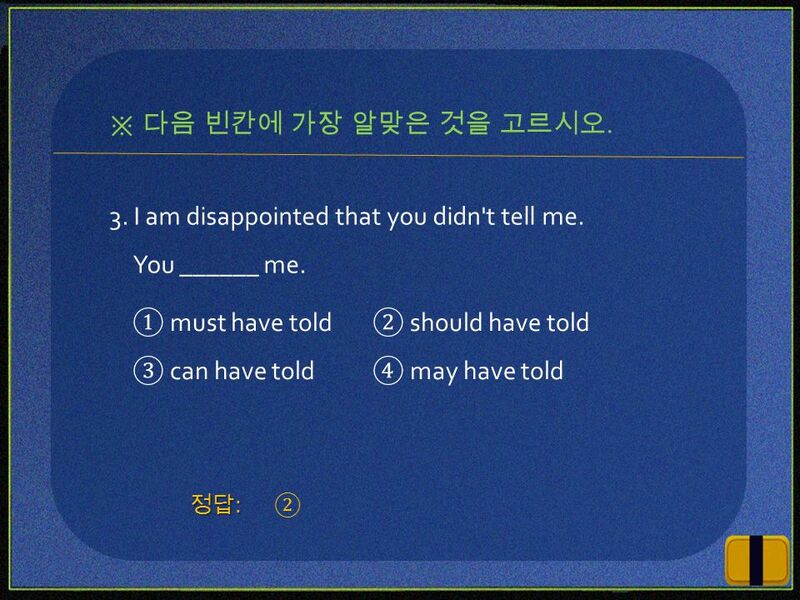 too ～ to 용법 too + 형용사 / 부사 + to- 부정사 = so + 형용사. 제 12 장 She is singing a song. ( 진행 ) Seeing is believing. ( S, C ) * I like singing. ( O ) (=To see is to believe.) (= I like to sing.) I’m looking forward.